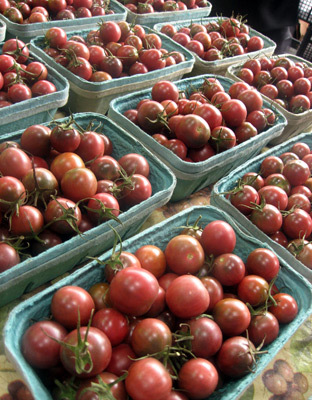 When the rain that was roiling menacingly in the bloated clouds over Minneapolis finally let loose and spattered down just as we arrived at the St. Paul Farmers' Market, I was worried. Did I just ask my friends to meet me out in inclement weather? Did we have enough umbrellas? Did we have extra layers, sweaters, or jackets? Would they Camille home, nursing sore throats, coughs, and eventually succumb to an effectively romantic wasting disease complete with lace hankerchiefs? But when I stepped out into the grey sunlight from the darkness of the minivan, I remembered: summer rain in Minnesota does not mean frigidity! Summer rain in Minnesota means wet warmth! 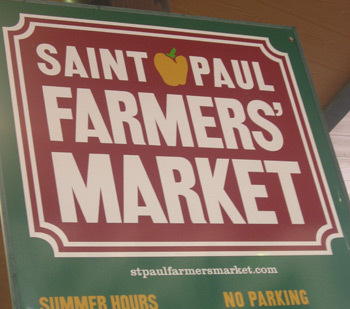 Getting gently spattered, I left my coat and umbrella in the car and set out to enjoy the covered St. Paul Farmers' Market to its fullest. Nestled among architecturally stunning buildings of downtown St. Paul and a few blocks away from the Mississippi, the Saturday farmers' market was decidedly populated with shoppers without being crowded by wheeled suitcases. In one small area you could get coffee, juice, bagels, and pastries to nourish you while shopping; you could also chose to sit down with your breakfast goodies on benches or at tables. 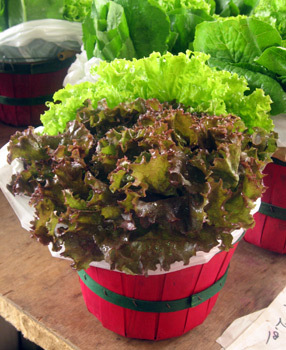 This bright and springy lettuce was the first thing I saw after walking into the farmers' market. I was not only entranced by the pristinely washed sheaves of green, but also by the adorable red basket. Almost all the farmers had these awesome retro-looking trucks pulled up to their table of wares. 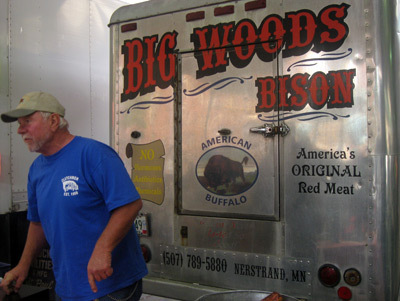 I have a particular love for Big Woods and Nerstrand, MN, since they produce my favorite blue cheese in the country. Just looking at this corn manages to make me both wistful and happy. 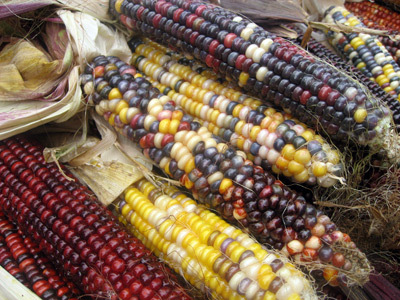 In color and in kernel rowing, this maize (or "Indian Corn") is riotously irregular and ready to be twined on someone's lamppost. Peter Piper picked a peck of peppered pickles. 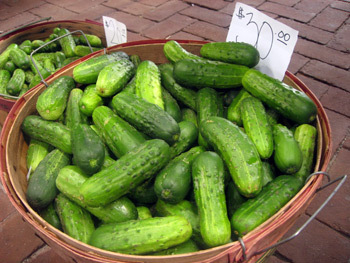 I never had such a canning urge as I did looking at these bushels of green and pimpled cucumbers. 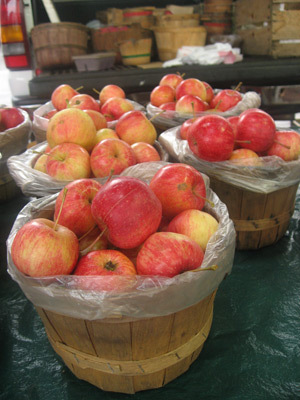 A beautiful reminder that cider and apple-picking season is just around the corner in Minnesota. These sublime specimens have perfect handles for apple ducking. Never in my five years of living in California have I seen this kind of cherry tomato. They were called Black Russians, and their maroon cheeks were streaked with purple striations. My father, who professes to hate cherry tomatoes, gulped down the gazpacho I squeezed out with these Black Russians and some heavily rooted sweet basil. 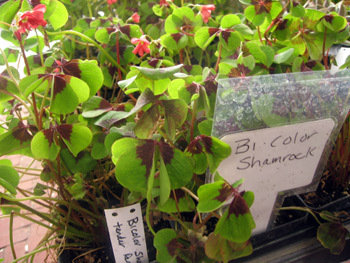 I was completely wowed by the herbs from this farmer. I've never seen such ecstatically hearty roots on herbs before. When I first saw this sign I thought, "Oh, Minnesotans and their FISHING!" 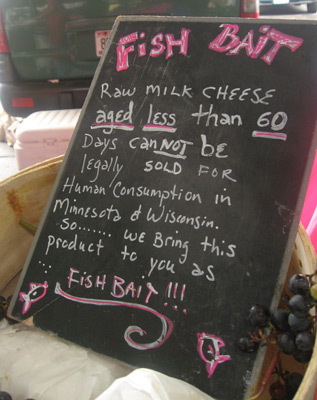 but then I realized that wasn't the point of the sign and I admired, "Oh, Minnesotans and their CRAFTINESS!" What a delicious way to get around the illegal cheese issue. 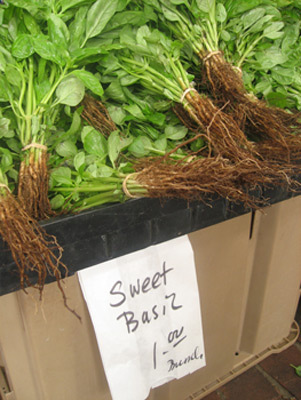 All in all, I was besotted and beguiled by the St. Paul Farmers' Market. The farmers were friendly and sometimes German accented, the patrons were polite and smiling, and the produce was prodigious and irreproachable. Even the typical musical talent that you frequently find at farmers' markets -- a banjo and guitar crew, togged out like the Baudelaire orphans -- distinguished themselves by cracking Sarah Palin jokes as they sawed and sung to their semi-circle of admirers.